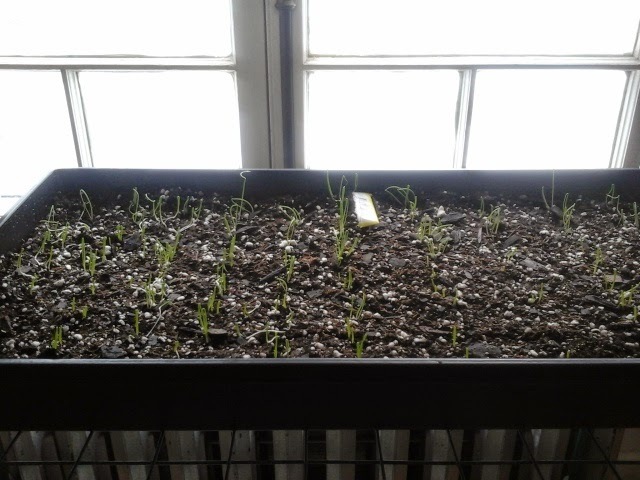 The onions are coming along! It was bound to happen. It was just one of those days where nothing much happened. I did some painting-walls and trim, not artistic, and then filled in for a friend at her office because she is out of town. I am working tomorrow too, but not until after lunch, and I hope to go get some manure from a dairy farm in the morning. Just enough to add to the cold frames. I do get excited about manure. On a weather note. It was 11 this morning, and didnt warm up much. I put these weather reports in mainly for myself, so I can compare next year. This is the coldest February on record. I dont think its official yet, as there are still a few days to go. But its going to be close to zero tonight and only in the teens tomorrow. So I think we will break the record. I am holding off starting any more seeds inside, as even the cold frames outside are too cold. Oddly enough, the hens are laying very well.... we are getting just about one egg a day from each hen, with the occasional off day. The new chicks have been ordered and are scheduled to arrive in about 10 days. That will be fun. I plan to video chronicle them.